Now, foodies will no longer need to choose as bagel brand, New York Bakery Co., has unveiled the ultimate mash-up that brings two giants of the culinary world together. Boiled and baked the New York way, the 12-inch bake is made by hand by the expert bakers at New York Bakery Co. Each bagel weighs in at 1.5kg, which is more than 16 times heavier than the average bagel. It gets sliced in half to form the base. 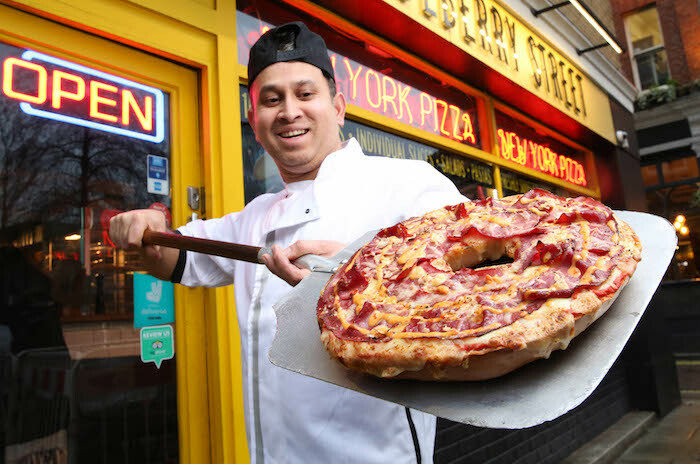 Made in partnership with the pizza professionals at Mulberry Street Pizza, the ‘Bagelizza’ is inspired by the flavours of the ‘Reuben’ – a classic in the delis of New York. Londoners will have the opportunity to bag a ‘Bagelizza’ with the innovators giving away hundreds of ‘Bagelizzas’ for free for one day only.